This minute wonderful village will be stamped in your memory for ever, enchanting captivating yet its size. Scopello developed around a manor house lording over the tonnara, the tuna processing plant, located at a lower level on the beach. 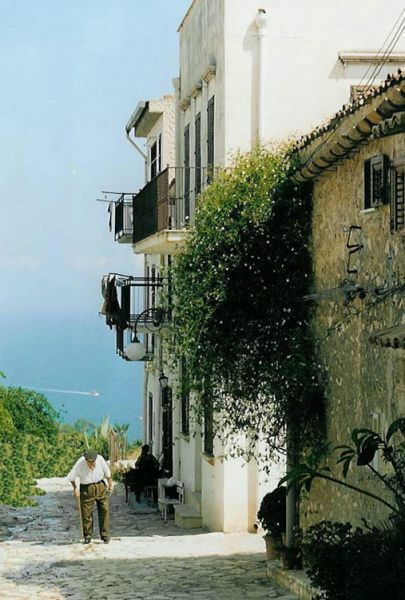 This picturesque village of bleached white walled houses and stone paved street appears to be coming out of 50s Italian classic. Scopello, due to its influx of tourists is prepared for a hearty welcome when it comes to eating. Surroundings and food are good and even better than you may imagine. Ristorante Torre Bennistra boasts a good restaurant where views, superb wine cellar and heavenly food create an excellent choice. La Tavernetta’s celebrated restaurant draws a great deal of guests for its tasty fish and seafood that guests feast on in the dining room or in the terrace. Ristorante La Terrazza dominates views over the adorable cove. The service is impeccable, welcoming and 100% trustworthy. Pastas, swordfish and its tempting wine cellar are its core draws. BY BUS: from/to Castellammare del Golfo (length:30 minutes, services : 4 a day. One of them calls at Riserva Naturale dello Zingaro ( length:20 minutes).